The obligatory duty of a horror film is to unsettle its audience. Unearthing an entry that goes beyond the call and restrains itself from the recent indulgence of exceptionally high-pitched scare tactics in mainstream fright-fests, are a rare occurrence. "If it’s in a word or it’s in a look. 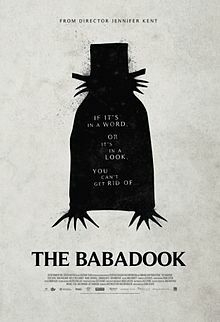 You can’t get rid.. of The Babadook". With Jennifer Kent’s full directorial debut (originally a 10-minute short called Monster), the shattering words and glaring looks are mere manifestations for the overwhelming threat that engulfs our protagonists’ world. Years on. Still chained to the difficult process of moving on. Aussie Amelia’s (Essie Davis) duties assisting patients on a psychiatric ward represent a poignant irony of her own mental capacity. Remaining deeply troubled after the tragic death of her husband, the strain on her relationship with her son Samuel (Noah Wiseman) is palpable, whose bizarre behaviour inspired by his fascination with the fantastical has only increased the concern of his esteemed educators. For all his cape-wearing enthusiasm and magic tricks, it’s Samuel’s obsession with an impeccably designed on the outside, ominous on the inside bedtime pop-up book entitled Mister Babadook, that truly accentuates his and mother Amelia’s inner torment. The respective harsh tones taken with each other juxtaposing with their gradual growing apart, it soon becomes apparent that there is a sinister ‘presence’ clouding their better judgment and shattering their ties shared with beloved others. Here, the monstrous prominence of its supernatural villain stylistically paying homage to the likes of Nosferatu, is a poignant vessel for the exploration of everyday themes such as crippling grief and lingering loneliness. Thus driving the film to have the emotional punch it possesses, rather than the eerie atmospherics and impeccable sound design that aid its impressive scares. Scattering proceedings with peculiar snippets of televisual terror as the grim colour palette remains constant, director Kent is undeterred in her focus to give top billing to the compelling and chilling depth of its central relationship. In turn disarmingly innocuous and haunting as he becomes consumed by the fear of potentially losing both parents, Noah Wiseman’s Samuel is a remarkable big-screen showing beyond his early years. The progression of Essie Davis’ character Amelia is far greater in its subtlety. Beginning as a sleep-deprived, softly spoken maternal figure, unravelling into an hysterical, unhinged mess, her performance is exceptional within such genre realms. The minor imperfections of its close a forgivable gripe, The Babadook is a brilliantly acted, well-sustained chiller, that proves refreshing and deeply affecting in its superior approach to an age-old concept. Find Darryl Griffiths on Twitter @LegallyBOD.